Because cats really do care about the location, size, smell, and cleanliness of their litter boxes, it is important to provide a toilet facility that meets their standards. Cats like to be clean. Since cats have to climb into a litter box and will get the odor of whatever is in the box onto their fur, they prefer to enter a box that is clean. If you have been getting away with a less than perfectly clean box and your cats are not protesting, then you have been very lucky. Also, since cats lick themselves to bathe, and since they prefer to be clean, cats will be ingesting some of whatever you use for their litter. For health and other reasons, this should be an important consideration. The most important thing to remember is that changes in an animal’s behavior are indications of a problem. Animals do not suddenly change their behavior for no reason. When it comes to litter boxes, the first thing a change in behavior might indicate is a health problem. While each cat is a unique individual and has unique preferences and tolerances, here are some simple litter box tips that may be helpful to you and your cat(s). 1. Make sure the box is large enough for the cat. A box that fits a kitten well might become too small for the same cat as an adult. Adult cats come in a variety of sizes, so keep that in mind as well. 2. “Location . . . location . . . location” – not just a slogan for real estate. Put litter boxes in places that are easy for each cat to get into and out of without being trapped or jumped on by other felines in the house. Also, choose a location that is just plain easy for a cat to use. 3. The recommended number of boxes to have is 1 for each cat + 1 more. This may not be necessary if you have only 1 or 2 cats, but as the number of felines goes up, this general rule becomes more important. 4. 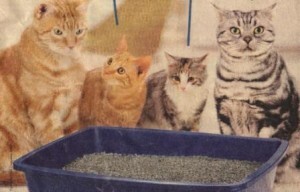 Plastic litter boxes eventually pick up the smell of urine. It is advisable to replace boxes every couple of years. 2. Change the litter completely at least once a week, especially if you are not using a good quality clumping litter that is easy to pick out. 3. Choose a scent-free litter or one with a mild scent that is natural to the product of which the litter is made. Cats have a strong sense of smell and may not like having a chemical smell on their fur. This is also healthier for your cat, as the chemical gets on them and then they lick it off when they groom. 4. Do not use chemicals or anything scented when you wash the box. Cat noses are much more sensitive than human noses, and if you use something that they don’t like to smell, they may stop using the box. Remember, also, that chemicals can be toxic, so use natural, safe products. 5. Some cats are very sensitive to the texture of the litter, especially if the cat has been declawed. A softer litter can increase a cat’s comfort even if it is not a clumping litter. 6. When changing to a new litter, it is best to mix the two litters together for a week or more. This gives your cats a chance to adjust to the new litter. Some cats, as they age, develop arthritic problems in their backs and hind end. This may make it difficult for them to climb into a normal litter box. Here are some things you can do to help your senior citizen feline continue to use a litter box. 1. Try a cookie sheet as a litter tray so your elder cat can easily climb into it. 2. Some cats will adapt to “wee-wee pads” while others still prefer to have litter in the cookie tray so they can cover their feces and urine. 3. A cardboard box can surround the tray with one end opened flat for easy access. This will minimize how much litter gets spread around due to the low sides of the cookie sheet. It will also keep the tray from moving around when the cat is using it, making it more comfortable for your cat to adapt. 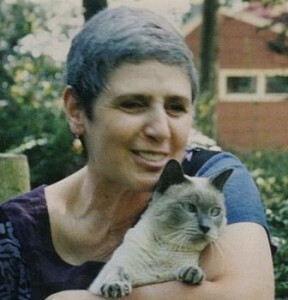 Nedda Wittels lives with two feline companions, one Siamese Supervisor and one Orange Cat Contingent Earth Healer. Through her work as an Animal Communicator, Nedda helps people establish a deeper connection with themselves through a deeper connection with animals, the Earth, and all of Nature. .
Nedda offers private Animal Communication sessions; Shamballa Healings for humans and animals; Spiritual Empowerment sessions for humans; TWA (Telepathy With Animals – Animal Communication Coaching Program); and the Heart Centered Living Coaching Program. Join her mailing list at http://www.RaysOfHealingLight.com to get the free report “Eleven Keys to a Win/Win With Your Animals” and to read more about Heart Centered Living, Spiritual Ascension, and Animal Communication. Hear recordings of talks by Nedda and her colleagues at http://www.AnimalCommunicatorForum.com.